Alloa Athletic chairman Mike Mulraney expects Scottish football's two parent bodies to find compromise over changes to the game's structure on Tuesday. Mulraney and his Scottish Professional Football League colleagues want more influence over the Scottish FA. 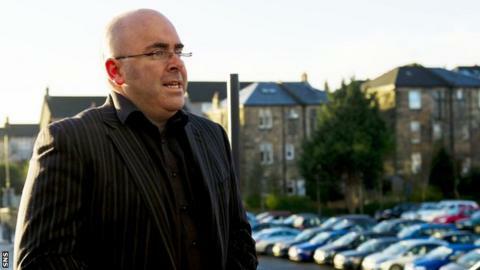 "I think there is a journey to be undertaken - it is being undertaken," he told BBC Scotland. "We've got a meeting with them tomorrow and we think that the SFA are minded to consider what we're saying now." Mulraney dismissed newspaper headlines over the weekend suggesting the SPFL - comprised of the country's league clubs - was bidding to seize powers from Scottish football's governing body. "Someone said to me, 'is this a takeover?'" he said. "Well, you can't take yourself over. We are the SFA. "It is our SFA. We want it to be as good as possible." Mulraney hoped that the SFA would see the worth of the SPFL proposals. "To start with, they were more than reticent to see these changes take place," he said. "But the conversations I've had with them now are that they can see real merit in some of them but would want other ones either changed or tweaked. "We think they have changed their mind on a couple of them and now agree with us." Mulraney did not wish to be drawn on which of the four proposals might find favour, but the criteria for new clubs and, in particular, the running of youth football are likely to prove the most contentious. Under SFA rules, resolutions at annual meetings require the backing of 75% of its 94 members to be approved and the professional clubs fear that new members would dilute their influence. Mulraney says that, should the SPFL board fail to achieve compromise with the SFA, they would put forward formal resolutions to the SFA annual meeting in June. "We are not going to go away," he said. "We don't think it is particularly revolutionary - it is just appropriate change. "We just want to be able to select the best people to be on the board and we want a little bit more representation on that board." Mulraney said it was not a criticism of chief executive Stewart Regan and the recent reforms made to SFA governance, saying he has "done an excellent job". The SFA has been keen to promote the work done by performance director Mark Wotte, pointing to successes at age-group level, in women's football and the rise of the men's national team to 22nd in the world rankings. However, the SPFL believe there is a lack of cohesion between Wotte and Jim Fleeting, the SFA's director of football development. Furthermore, they have concerns about the allocation of budgets. "The current youth system is under Mark Wotte and Jim Fleeting and the two parties have, at best, a loose relationship with each another," said Mulraney. "We don't have any cohesiveness about what the coaches coach, how they coach, because it is two separate systems at present. "Many people think it is a success because it is better than what was there before. That doesn't make it the best it can be. "We need the senior clubs to help develop football and we've got some of them that are incredibly unhappy with what the process is doing and where it's going. "It doesn't mean to say that senior football clubs take over the development of grassroots football. "We think it is reasonable for us to say, let's investigate whether the money can be spent better, to impact more on the kids. "There's about £12m being spent. If we thought that is being spent as well as it could be then we would never have made proposal number four." Mulraney said that the SPFL was open to considering counter-proposals from the SFA but added: "Let's not close all the doors because people are frightened or are protecting their fiefdoms."